With the launch of IPCC 1.5 degree report, the urgency to take climate actions is high. The increasing occurrence of extreme weather events around the globe shows that climate change is not something obscure or a future scenario. It is the current reality. We not only need to reduce GHG emissions, but also improve our capacity to adapt to the new reality. 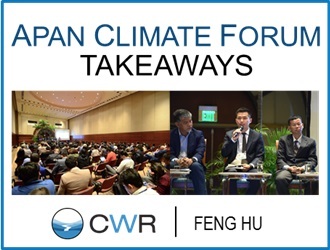 During 16-19 October, I participated in the 6th Asia Pacific Climate Change Adaptation Forum and spoke at one session on Policy & Governance (see photos). It is evident from discussion throughout the forum that the conversation on adaptation has been mainstreamed and the focus has moved onto how to accelerate & scale up actions. In the same week, on 18 October, the Global Commission on Adaptation (GCA), consisted of 17 convening countries such as China, India & Bangladesh, was set up. Branding itself as a solution broker, it aims to accelerate adaptation action and support globally. One of its discussion papers identified 5 key factors that drive action: 1) political will and sustained leadership; 2) policy commitments, mandates, or legislation; 3) coordination across agencies and sectors; 4) information and knowledge; and 5) finance and supportive budgetary processes. The first three are related to governance. The discussion below will thus focus on the 3 aspects: governance, information & knowledge, and finance. Adaptation needs have been widely acknowledged and assessed by countries. According to UNFCCC, by April 2016, 83% of countries, a total of 137 Parties, included an adaptation component in their INDCs, which all covered information on key impacts and vulnerabilities. Countries are also moving to integrating adaptation into social and economic development planning. National governments could look for synergies between different national goals & strategies, such as the Sustainable Development Goals (SDG), Nationally Determined Contributions (NDC), National Adaptation Plan (NAP) and disaster risk reduction (DRR) strategies, etc. At the very local level, especially cities, there is also progress in adopting a more integrated approach. Representatives from Arup shared on China’s ‘sponge cities’. The Chief Resilience Officer (CRO) of Bangkok city, one of the 17 Asian cities under the “100 Resilient Cities” initiative, shared their experience of adopting both nature-based adaptation solutions and grey infrastructure. Moreover, for countries sharing the same river basin, transboundary cooperation should also include climate adaptation and disaster management. As proposed in our recent report “No Water No Growth – Does Asia Have Enough Water To Develop?”, through better water-nomic cooperation, riparian countries could focus on shared benefits & development and resolve transboundary issues. One positive development is, more cooperation between Mekong countries and existing regional bodies is expected, as shown in the First Lancang Mekong Water Resources Cooperation Forum held during 1-2 Nov 2018. We often hear the complaint: there is lack of data. For many parts of the world, with technological advances, we actually have access to a significant amount of data, from near real-time earth observation to government statistics, most of which are also free. What is often lacking is, however, data with usable resolution/precision and accuracy. Japan is trying to establish an Asia Pacific Adaptation Information Platform (AP-PLAT) by 2020 to share climate risk information online. It has already established its national system (A-PLAT) and is also helping Thailand in developing one. However, there still remains the challenge of uncertainties in adaptation decision making, as highlighted by several economists during the forum. Such uncertainties come not only from the nature system and our current climate modelling, but also the human and social systems. But, it “should not be the excuse for inaction”, notes one expert. To overcome such challenge, Paul suggested that we should first understand the project (rather than the projections) and focus on what matters for the region. Jun Rentschler from the World Bank highlighted the importance of local stakeholder consultation in identifying investment options: the final decision may not be the “optimal” option but the least “regretful” one. In short, it is not enough to simply put out information. For users, especially the private sector and many vulnerable communities, guidance will be needed on how to use information. Many experts highlighted the role of the private sector in mobilising finance for adaptation. This is because, international climate finance and national funds alone simply won’t be enough. For example, only USD2 billion in climate finance from multilateral, bilateral national funds was approved for the HKH 8 from 2003 to May 2017. This is far less than the needs: three of the HKH 8 specified their adaptation finance needs in their NDCs, which are Afghanistan (USD10.785 billion, 2020-2030), Bangladesh (USD40 billion, 2015-2030) and India (USD206 billion, 2015-2030). This is not to mention that for the four most at-risk HKH river basins (the Ganges, Indus, Yellow & Yangtze) alone, the estimated total GDP is already at USD3.8 trillion in 2015. To fill the finance gap, multiple channels and innovative mechanisms need to be sought after. For instance, Anand Patwardhan from the GCA proposed “Nexus” financing to support projects that delivers multiple benefits and/or covers multiple sectors. ADB commits USD80 billion in climate finance from 2019 to 2030. In China, water rights trading has been piloted in 7 provinces since 2014, whose experience could be shared in the region. Moreover, for the private sector to take part, it is not only important to create economic incentives, but also to push for better disclosure. Xianfu Lu from ADB stressed that “disclosure is the first step…[because] what cannot be measured cannot be managed”. Already, financial rating agencies have started looking to factor in climate risks and the broad ESG issues. From 31 July 2016 to 31 July 2018, S&P Global Ratings found 147 cases globally where ESG factors resulted in a rating action. Tools such as S&P Global Ratings’ Green Evaluation provide an asset-level assessment framework of the environmental impact and climate risk attributes of investment portfolios. Last but not least, it is very important that our current modelling & measurement cover the poor. As highlighted by David Simmons from Willis Towers Watso, in the face of climate disasters, the poor often has the least to lose in capital terms, but the most in all other terms. He also asked, if we embed climate disasters into sovereign rating, what about the potential loss of economic opportunities for the poor? The forum has ended, but it leaves us a lot more questions & challenges to work on. 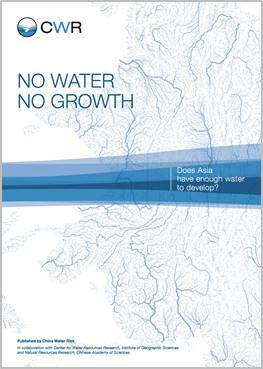 CWR Report: No Water No Growth – Does Asia Have Enough Water To Develop? – Rivers are important to Asia. The Amu Darya, Brahmaputra, Ganges, Indus, Irrawaddy, Mekong, Salween, Tarim, Yangtze and Yellow are the continent’s cradles of civilization. Much of Asia’s population and economy are clustered there. Yet, climate change, evident in their common source region, the Hindu Kush Himalayas (HKH), threatens their upper watershed.The flow of these 10 mighty rivers that provide water to 16 countries could be affected. One in every 2.5 Asians live along these rivers and over USD4 trillion is generated in these 10 river basins, but there is little conversation on the threats to Asia’s Water Towers or water and climate risks faced by these rivers.To catalyse such conversations, this report seeks to provide an overview of the challenges that are extremely critical to Asia. Upper Yangtze: Integrated Water Management & Climate Adaptation – Experts from China & Switzerland introduce their joint project to enhance water management & climate adaptation in the Jinsha River Basin. What lessons have been learned & what is next?